Vickie's Kitchen and Garden: Review of Jeremy Camp's New CD, The Answer, Plus a Giveaway! The Answer- Releases Friday, October 6! and in our lives that Jesus is ALWAYS with us and HOLDS THE ANSWER! I've been listening to Jeremy Camp for a long time and his wonderful music and praise songs have always drew my attention. You see his music has been flowing full blast out of my youngest daughters room forever. I would ask her "who is that?" and she would say "Jeremy Camp don't you remember?" I finally could recognize him right away and I've grown to love his powerful Christian music. His new CD, The Answer, reminds us that Jesus is the Answer with everything we go through in this life. The music drew me in at first to this CD but the words spoke to my heart. As I listened, I was reminded about how much God has been there for me and how he has changed me for the better. He reminds us too that God fill you with so much joy and love you will want the world to know how you have been changed. 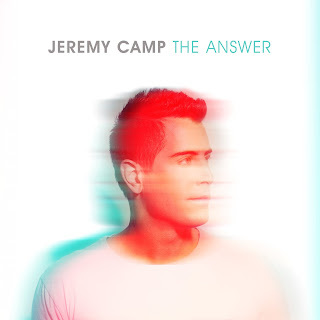 This giveaway for the Jeremy Camp CD, The Answer, is for U.S. Residents only.